Ben Lemberg, the box-owner of CrossFit am Lech, is giving us a little insight into what happens at his BOX! Enjoy another episode of our Europewide BOX interviews. I was introduced to CrossFit by a friend of mine over four years ago and immediately got addicted to it. At the beginning, the only source of information about it was the internet and there was no box to be found in Germany, at the time. That’s why we went ahead, did the first ‘hero’-workouts in a regular gym and realized that this is what fitness should be all about in Germany, too. I myself was an apprentice in the fitness area and quickly came to the conclusion that the usual job in a ‘fitness studio’ (i. e. telling people how to work with machines and so forth) wasn’t something I could either support or do for the rest of my life. By coincidence, I found the perfect warehouse and so the dream about an own box became reality even faster than I had thought. Thanks to some close friends a could turn this warehouse into “CrossFit am Lech” within one month. I appreciate the opportunity to work independently and implement my ideas, but the most important aspect of all is this: We provide an athletic center for people of all ages! The community! We care a great deal about the fact that our members feel save and want to have a good time with us! Furthermore, we set up our box with love for detail in order to provide a lot of space for free movement and high-quality equipment. At the moment we list about 90 members (less female than male). Our clients tend to be between 23 and 30 years old, but we have been able to draw some of the ‘elder generation’, as well. Most of them train with us to improve their health, get fit and balance out their everyday life. Besides that, we also have a team of athletes joining competitions, following a special programming. As I said, the more advanced athletes of our gym follow a separate programming with additional exercises. On top of that we have “mobility” and “weightlifting” classes three times a week. Of course we do! We have an electronic paleo-cook-book with collected recipes which is updated every month. Those members, who take interest in it, can get the entire file via email and we also answer any questions that might come up personally. After a free training session, what follows, is a one month trial period in which you will run through “Onramp” classes. These are implemented for you to learn the basic techniques and standards of movement. Furthermore, you will be able to get to know our gym and our members. After this month you have the opportunity to receive a membership. Shortly after our opening we held a team challenge. We also try to take part in all the challenges boxes nearby offer and even participated in a weightlifting competition not too long ago. Certainly! 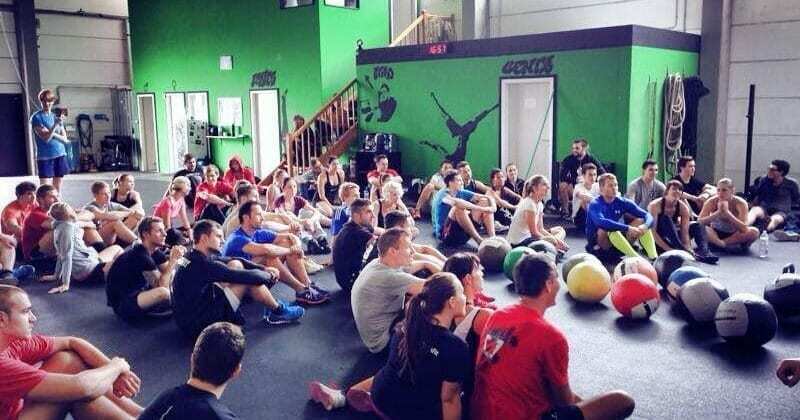 All Crossfitters, and those who want to become one, are welcome at our gym! Just let me know (ben@crossfitamlech.de)! The most important aspects to me are having fun, and providing a safe environment along with a sophisticated programming to enable good and effective training sessions for everybody. It’s our goal to see improvement in and on each of our members. Therefore, we put great focus on technique and the standards of every movement. We are happy to be part of the CrossFit community and look forward to seeing new faces in our gym and in the CrossFit-World!